Bruce Lee broke open the market for marital arts films around the world. The American-Hong Kong actor and Jeet Kune Do master had finally made the genre a raging success in theaters that had previously been feasting on Spaghetti Westerns. But shortly after the success, Lee died in the summer of 1973. 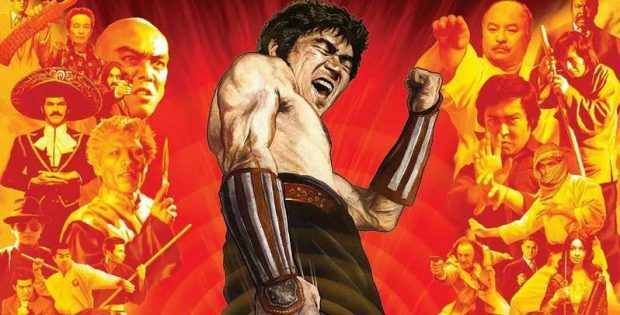 Every Asian producer with access to a camera and a kid that could flail his arms in the air was quick to come out with the “Next Bruce Lee.” Dozens of films flooded the film markets with stars that looked like Bruce Lee and names that sounded like Bruce Lee. They were eager to make the international audience think it was really Bruce Lee and the English translator botched the spelling. Japan’s Toei studio wasn’t eager to get viewers “the next Bruce Lee” when they released The Street Fighter in 1974. They gave theatergoers what comes after Bruce Lee in Sonny Chiba’s Terry Tsurugi in The Street Fighter. The film received an X-rating and Toei made two more that are now brought together in The Street Fighter Collection. The Street Fighter (1974 – 91 minutes) is not a piece of cinemamatic Bruce Lee fan fiction. Bruce Lee films have him as a rather peaceful guy who needs to be attacked before he’s willing to throwdown on screen and show off his fists of fury. He’s a charming man of peace who uses his lethal fists as a last resort. This is not the case with Terry Tsurugi. He arrives in a prison disguised as a monk to give last rites to Junjo (Masashi Ishibashi). Instead of hearing a confess, the duo swap chops in a cell until Sonny administers a blow that cause Junjo to collapse on his way to the hang man’s noose. Terry and his partner Rakuda (Goichi Yamada) abduct the corpse of Junjo after it leaves the prison grounds. Turns out he merely did a hit that could make people think a man is dead. He smuggles Junjo out of Japan and meets up with the escapee’s kids to get the other half of his fee. This turns bad since the kids don’t have the cash. Terry isn’t a charity organization and things don’t work out well for the kids. His next gig is being approached to kidnap woman whose father died and she inherited the oil company. However Terry finds out who is really paying him and decides to protect the oil heiress. There might be better money in that line of work. However the party that want her kidnapped aren’t giving up and they also want Terry dead for double dealing them. He’s going to have to fight his way out of this problem. The daughter of Junjo is played by Etsuko Shihomi who would shortly be the title character in the Sister Street Fighter series for Toei. All four of those films have also just been released on Blu-ray too so it’s a Street Fighter spring for fans of both series. The Return of the Street Fighter (1974-82 minutes) has Sonny getting hired by the Yakuza to track down and kill a person who has information they don’t want out. Terry takes the gig because the money is too good. But he has reservations when he discovers the person that’s been marked for him to kill. He has a simple choice to either kill the person or be marked for death for screwing over the mobsters. Also there’s a rematch from the first film. The Street Fighter’s Last Revenge (1974-83 minutes) didn’t arrive in America until 1979. There are two versions offered up on the Blu-ray disc. There’s a US cut that is only 79 minutes. The folks at Shout! Factory were able to transfer the four minutes of excised footage to create the complete Japanese cut. This isn’t merely a case of the US version snipping out the extra bits of violence to enjoy an R-rating. They folks at New Line recut the film. Toei plays around with Terry so that he’s not just the roughcut martial artist. He’s a little more sleek in this first film where he gets involved with a synthetic heroin plot. Things get nasty fast and eventually someone gets their beating heart yanked out. You’ll want to watch Japanese version first to get the full effect even if it requires reading. The Street Fighter Collection brings all the bone crunching joy that Sonny Chiba brought to the screen before the MPAA had it snipped away. Chiba’s Terry gets to be as nasty as he wants to be on the screen so that when he does do something nice it, you immediately fear he’s playing an angle. He’s not a conventional Hollywood action hero. Even when he does turn good, it’s not some pathetic cliche that turns him around. He’s just looking at a bigger picture. Man doesn’t last long as a hired killer if they don’t have a long term survival instinct. Most importantly Sonny doesn’t allow Terry to be not a clone of Bruce Lee. He’s not a faux Dragon. He’s the real Street Fighter. The video is 2.35:1 anamorphic for all three films. The transfers mix in elements from the Japanese cuts into the American masters. Things look pretty smooth when they cut into the previously cut nasty bits. Audio includes the original Japanese DTS-HD Master Audio and the original American Theatrical release dub. The Street Fighter has ’90s re-release dub in DTS-HD Mono. Don’t believe the rumor that this set was only going to have the dubs. The ’90s re-release is the best of the English mixes since Sonny’s voice is a lot of groaning in the first dub. The movies are subtitled in English. Interview with actor Sonny Chiba (27:10) meets up with the star who is happy the film is coming out, but is done with karate He talks about missing the Olympics because he hurt himself in practice. This made his adjust his career into a life in acting. Sonny speaks of how the role evolved and the recurring cast in the trio of films. He explains who changed his name from Shinichi Chiba to Sonny. He speaks Japanese so the interview is subtitled in English. Interview with Trailer Editor/Fimmaker Jack Sholder (13:03) talks about how he got hooked up with New Line to make the trailers for the films they’d distributed. He explains his approach to creating the trailer. He also had to slice films to get the right MPAA trailers. He has a great tale of how New Line decided to get The Street Fighter films to distribute in America. Jack would go on to direct The Hidden and A Nightmare on Elm Street 2: Freddy’s Revenge. US Theatrical Trailer (2:26) plays up the badass nature of Terry Tsurugi. He shows up ready to beatdown. There is a bit of comedy when they declare he’s 6’6″ – although once he starts fighting, he feels like he’s 6’6″. Japanese Theatrical Trailer (3:00) really plays up the image of Bruce Lee on a billboard next to Sonny. Still Gallery (6:32) are promo pics, lobby cards, international posters, newspaper ads and VHS boxes. US Theatrical Trailer for Return of the Street Fighter (2:10) lets us know his friends want to see him dead. US Teaser Trailer (0:33) is all action. Japanese Trailer (3:02) shows the fighting isn’t over between old rivals. Still Gallery (3:02) includes posters, lobby cards, photos and more from The Return of the Street Fighter. US Trailer for The Street Fighter’s Last Revenge (3:06) doesn’t quite have the impact of the first two trailers. Japanese Trailer (3:04) promises all the fighting delivered in the first two entries. Still Gallery (1:37) has photos and posters. Shout! Factory presents The Street Fighter Collection. Directed by Shigehiro Ozawa. Starring: Sonny Chiba, Etsuko Shiomi and Rin’ichi Yamamoto. Rated: R. Boxset Contents: 90 minutes. Released: March 26, 2019.